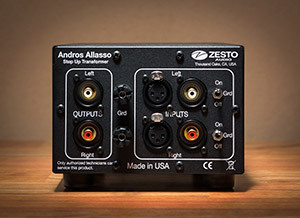 This newest product from Zesto Audio is aptly named as it is designed to work with up to 4 different tonearms or turntables. 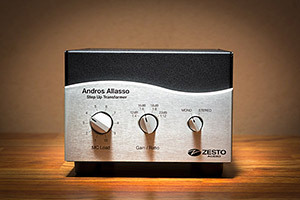 Building on the success of Zesto's original Andros Phonostage, George wanted to take it further, not only sonically but with more features resulting in a quieter, fuller and more dynamic sound. The Andros Tessera is built with a passion for Analog, designed with 100% tube circuitry and no solid state devices anywhere in the signal path, as well as all the switching is done with reed relays. This phonostage has a new circuit design that is partnered with significantly upgraded larger MC step-up transformers to capture the most delicate signals in the grooves. See the review in The Absolute Sound here! 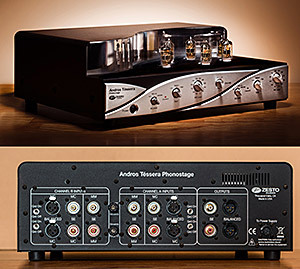 The Andros Deluxe Phonostage is created from taking the very best attributes from both the Andros 1.2 Phonostage and the Andros Tessera Phonostage while maintaining its own unique sonic personality. We wanted the same footprint as the Andros 1.2 and many of the internal features of the Tessera. The extensive grounding scheme, the circuit design and steel enclosure all play a significant role in the noise reduction of the phonostage, so you can hear the quietest passages in your music. Inspired by RCA's vacuum tube circuit designs from the 1930s, the Andros has been engineered to bring you the clarity and depth of the original recording. Your highs will be crisp but not overly emphasized, your midranges clear and present without being shrill and your lows full and firm without being boomy. For true audiophiles, nothing equals the warmth, dynamic range and fidelity of vinyl records. 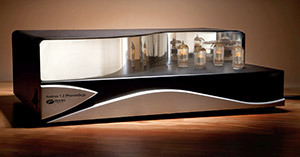 A critical component of every music lovers Vinyl playback system is the Phonostage or Phono preamp. Words are inadequate to the task of explaining the Andros. You simply must hear it to believe it. What Does a Step up Transformer do? It amplifies the delicate signal from your MC cartridge. An MM cartridge has a higher output than MC, so a MC needs to have a different step up ratios/gain to reach the same output. The Allasso is extremely versatile. It will work with any standard phonostage with a 47K MM input. You now have 40 options in Stereo and 40 options in Mono. It has enough adjustments to tailor it specifically to your cartridge or your next one. It’s just you and your ears, no math skills required. Raven Phono RPS100 is for those who are searching for the absolute pinnacle of analogue musical enjoyment. If so, please forget the usual hifi criteria for a moment. Perfect analogue musical enjoyment is only possible when the music is reproduced with realistic dynamics, as well as with real emotion: music as experience - powerful physicality, but also fine dynamic nuances with an incredible airiness, detail that is more than simply high frequencies, rich timbre, speed and impulsivity. The music must positively 'breathe'. The RPS 100 has two-stage amplification and active EQ. In the discrete power supply unit we use high-quality MKP capacitors. To ensure the lowest possible noise, we use an elaborately stabilized DC heater supply. 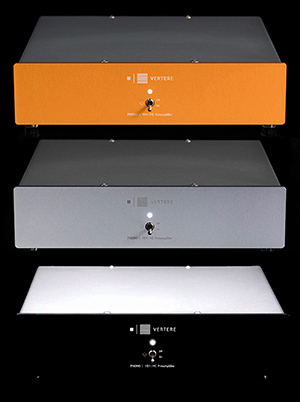 For the Moving Coil stage we also employ high quality input transformers. 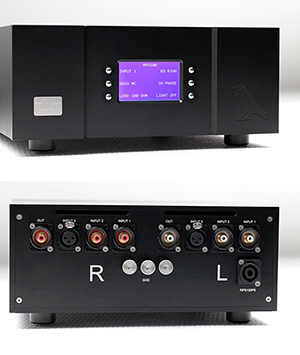 The Raven Phono RPS 100 has three user-configurable inputs. The subtle push-buttons on the fascia allow you to choose between Moving Magnet and Moving Coil, impedance match the cartridge, alongside the RIAA EQ curve you can select from a further four EQ curves, you can also invert the phase and switch off the display. The Zanden 120 is an understated, two-box jewel. The cases of the main unit and its outboard power supply are of mirror-polished stainless steel, and the faceplate is sand-blasted acrylic, which gives it the look of opaque, milky porcelain. The rear panel boasts a wealth of connections. 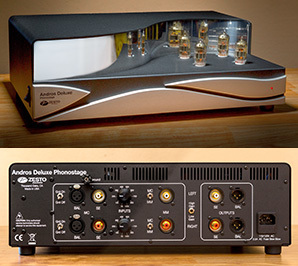 The unit comes standard with two sets of phono inputs: one single-ended and one balanced, the latter included because Yamada feels it's the better type of connection. Besides its solid-state amplification circuit, the 120 uses four Jensen step-up transformers for passive gain: one pair each for high- and low-impedance cartridges. The low-impedance pair provides 36 ohms with 75dB gain, the high-impedance pair 470 ohms with 63dB gain. Yamada feels these two settings will accommodate the vast majority of available cartridges while maintaining the highest quality of sound.